During April 1937 the Norwegian Government entered negotiations for the purchase of Gladiators from Gloster Aircraft. The order was placed in June 1937. From the outset it was intended that twelve aircraft would be involved, but after six Mark I’s had been delivered to Oslo during August 1937 (with Colt 0.303-inch guns) it was decided to revise the Norwegian standard of preparation to match that of the British Mark II. It was proposed to deliver the final six Gladiators in 1938 but, due to the delays in the introduction of the Spitfire that year, the Norwegian order was subordinated to that of the RAF. In the event the last six Gladiator Mk.II’s ever built (N5919-N5924) were diverted from the RAF to Norway and delivered in 1939. The Norwegian Gladiators were numbered 413, 415, 417, 419, 421, 423, 425, 427, 429, 431, 433 and 435. Shuttleworth Collection's Gloster Gladiator in the markings of a Norwegian Gladiator. By 8 April 1940, the day on which German warships were reported to be approaching the Norwegian coast, nine Gladiators (four Mk. I’s and six Mk. II’s) remained as the sole regular fighter defence, equipping Jagevingen (Norway’s only Fighter Wing) – based at Fornebu for the protection of Oslo. On that day only five (or alternatively three) of the fighters were serviceable but by midnight, on urgent orders by the Wing commander, Captain Erling Munthe Dahl, a total of seven machines were made airworthy (nos. 413, 419, 423, 425, 427, 429 and 433). No spark plugs were available for the other three, so these and two Tiger Moths were pulled to the edge of the airport and camouflaged. At dawn the next morning, 9 April 1940, Jagevingen had seven of the ten available Gladiators serviceable, while the unit had ten officers and sergeants available to fly them, three of them under training. The serviceable Gladiators were 413, 419, 423, 425, 427, 429 and 433. At 05:00 Second Lieutenant Finn Thorsager (Gladiator 433) and Lieutenant Arve Braathen (425) were sent off after the noise of aircraft engines was heard overhead. Thorsager spotted an aircraft with twin rudders about one kilometre away, which he identified as a Do 17; it was almost certainly a Bf 110. He attacked four or five times before it disappeared into cloud. Braathen saw a large aircraft, but was unable to catch it. Both pilots then returned to Fornebu. Lieutenant Dag Krohn (423), Sergeant Kristian Fredrik Schye (427) and Sergeant Per Waaler (429) were sent off just before 06:00, but found nothing and returned about 50 minutes later. At 07:00 they got reports of large formations of enemy aircraft were approaching. This resulted in that five Gladiators took off shortly after 07:00 led by Lieutenant Rolf Thorbjørn Tradin (Jagevingens second-in-command) (429), followed by Lieutenant Dag Krohn (423), Second Lieutenant Finn Thorsager (433), Sergeant Per Waaler (425) and Sergeant Kristian Fredrik Schye (427). Passing over the fjord leading to Oslo, they saw below the stricken German warship Blücher burning, but were then ordered over the radio by the commander of Jagevingen, Captain Erling Munthe Dahl, to patrol over Nesodden. Over Steilene at 5,500 feet, they saw a large formation reckoned to be more than 70 strong, composed of bombers and transports, some 2,000 feet below, and Tradin led the Gladiators to the attack. The aircraft they had spotted were undoubtedly the leading Ju 52/3ms of II/KGzbV 1, followed by those of KGrzbV 103. Meanwhile two more Gladiators had taken off, flown by Lieutenant Arve Braathen (413) and Sergeant Oskar Albert Lütken (419). Lütkens aircraft suffered an engine failure just after take-off, and he landed again straight away. Lieutenant Tradin attacked an enemy aircraft and saw hits on the starboard wing and engine. Smoke poured from the engine and it rolled over on its back, spinning down to apparently crash at Torgskjær, outside Høvik. This was a Ju 52/3m (Werk. Nr. 6570) of 5 staffel II/KGzbV1 flown by Feldwebel Albert Meier who was reported shot down by a pair of Gladiators after the unit had run into fog over Oslofjord. The Junkers crashed north of Oslofjord with the loss of Meier, his crew and 12 members of 2./FJR 1. Tradin then attacked a second aircraft, but it escaped in cloud. During these attacks three of Tradin’s guns ceased operating, and now as he completed his attack the fourth also jammed. He returned to Fornebu were he could see two Gladiators on the field, but Captain Dahl (who was directing operations from his base control tower) warned him that an attack was underway, and he departed to seek a landing elsewhere. Sergeant Waaler had also attacked an aircraft which he identified as a Heinkel, which started to go down before he lost sight of it. This claim is not confirmed with German sources although Captain Dahl reported that he saw this machine spin and crash near the airfield. Maybe this was the same Bf 110 that Krohn shot down (identified as a ‘Do 17’). Waaler was then attacked by Bf 110s. In the thick of a dogfight, Waaler ran out of ammunition and turned for base. His engine began to give problems however and started to cut as he went in to land. His Gladiator had probably been hit by Unteroffizier Mütscherle, which claimed a Gladiator at 08:38. On the field he found Sergeant Lütken’s aircraft. Re-arming of Waaler’s aircraft began at once, but at this point the Bf 110s of 1./ZG 76 came in to strafe, and he was forced to leap from the cockpit and into a trench. Looking out, he saw both Gladiators in flames. The two Gladiators were destroyed by Oberleutnant Werner Hansen, which led eight Bf 110s of 1./ZG76 in the attack on the airfield. Suddenly I saw a German on contra-course 4-500 meters below me. I cut back the throttle, made a half-roll and dived straight down on him. I opened fire at a good shooting distance and kept him in my aim until only 50 meters separated us. Then he rolled over and disappeared downwards in a spin – later it was showed that he made a force-landing at Wöyenfjordene at Kolsås with both engines out of order. When I took up my machine from the dive, three German aircraft attacked me. I managed to shake off two of them, but the third closed in very close from behind. My left lower wing was hit, the wing was perforated and the fabric on the left side of the cockpit was shot trough by splinters. One of these hit me in my left upper arm and paralysed it. This meant that I couldn’t operate the throttle. Second Lieutenant Thorsager had sprayed all his fire generally at the many aircraft seen, and after exhausting his ammunition landed on a small frozen lake, Lyseren, 12 miles east of Oslo, taxiing his aircraft onto firm ground. From here he was driven by car to Oslo where he rejoined Jagevingen. The Gladiator (433) was left where it stood, and while it is thought that the Germans subsequently recovered parts of it, some ten years later a local farmer told Thorsager that he still had some pieces of the aircraft. 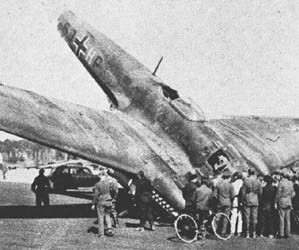 His first claim during the attack against a Heinkel may well have been the same Ju 52/3m that had been attacked by Tradin. Lieutenant Krohn meanwhile attacked an estimated 150 aircraft of several types - identified as He 111s, Do 17s, Bf 110s and Ju 52s. He claimed a Heinkel shot down south-west of Fornebu, and then a ‘Do 17’, which went down steeply over Nesodden after he had obtained hits on the cockpit area. Two Bf 110s then attacked him, but he escaped these in clouds, subsequently attacking another ‘bomber’ and believing that he had put the rear gunner out of action. Returning to Fornebu, he strafed some Ju 52/3ms on the ground here, then flew off and landed on the north-eastern bay of Tyrisfjord, where he found Rolf Tradin and his Gladiator. In 1978 members of the Norwegian Aviation Historical Society dug up the remains of the aircraft that Krohn had shot down at Nesodden, establishing beyond doubt that it had been a Bf 110; the crew had been killed. There is little doubt that this was the Bf 110 of 1./ZG 76 flown by Leutnant Erhard Kort and with air gunner Unteroffizier Heinrich Bockheimer. The last of the pilots in the air, Lieutenant Braathen attacked one aircraft which he forced to jettison its bombs near Brönnöya, although the Gladiator’s Mercury engine was running rough. He then encountered more aircraft over Høvik and chased one for a long way. This finally began to lose height with the starboard engine smoking, but he was then attacked from head on by a Bf 110 and had to break away. He landed on Lake Bogstad, but the wheel of his fighter went through the top layer of ice and stuck firm. The engine refused to produce enough power to pull the aircraft free and he had to abandon it. The Gladiators of Lieutenant Krohn (in 421) and Lieutenant Tradin (429) taxiing on Tyrisfjord. Later in the morning Lieutenant Krohn and Lieutenant Tradin took of from Tyrisfjord and flew to Hamar, landing here on Lake Mjösa. Unfortunately the wheels of Tradin’s aircraft went through the ice, and like the one flown by Braathen at Lake Bogstad, it was trapped immovably. It had to be abandoned, and was later captured by the Germans. In the afternoon Krohn took off again alone, flying to Brumunddal, where the remains of the Bomber Wing had arrived from Sola. Here however he was ordered to drain the oil from his aircraft as this was needed for the surviving Caproni, and the Gladiator had to be left behind. It was collected later in the month and flown to Vangsmjösa to join what had become Group ‘R’; it was the sole surviving Norwegian fighter. A KG4 He 111P and an He 111H of 8./KG26 (1H+ES) have crash-landed and run of the northern edge of Fornebu airfield. A Ju 52/3m is in the background. The battles over Oslo on 9 April were very confusing and according to the Norwegian authorities, eight Ju 52/3ms and seven Bf 110s were believed shot down and crashed near the airport with four other aircraft further away. The ground gunners had obviously claimed many of these, since the fighters claimed only six aircraft. According to German records, Luftwaffe lost two Bf 110s and a Ju 52/3m in combat, six Ju 52/3ms, one Bf 110 and one He 111 being brought down by ground fire. “…the Staffel was ordered to defend the dropping of paratroops (at about 0845) and the landing of airborne troops. At about 0837, the Staffel sighted a squadron of Gloster Gladiator single-seat fighters 15 km south of Oslo, in a strength of approximately eight aircraft. The Gloster squadron flew about 500m higher, coming down upon us from the sun. 1 Staffel at once turned towards the single-seat fighters, who because of the cloud layer, had apparently not seen us. We passed beneath and behind the Gloster squadron, then gained height to be able to make a surprise attack from the sun. The fighter squadron must have seen us however, since as we turned to engage them, in a second they closed on us. We at once climbed, and attacked them head-on. A section of the Gloster aircraft broke downwards, the others climbed. Due to the great manoeuvrability of the biplanes, several fighters succeeded in getting behind Bf 110s, but these were immediately fired on by other Bf 110s. After taking hits the fighters dived into the clouds and vanished, so that results could not be confirmed of the first dogfight. 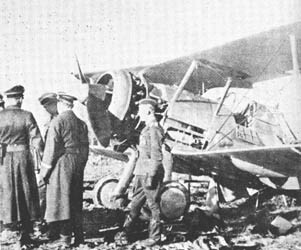 Evidence was given by Norwegian civilians that during the battle one Gloster was shot down in flames (this was claimed by Unteroffizier Helmut Mütschele and his gunner, Gefreiter Lorey at 0838), and two more made force-landings due to motor damage. Right: A destroyed Norwegian Gladiator is inspected by German troops at Fornebu. The sole surviving Norwegian Gladiator (423) was together with the rest of the Norwegian Army Air Force formed into a single unit at Vangsmjösa. At 09:33 on 21 April Sergeant Per Waaler took off in 423 to reconnoitre Gardermoen airfield to see if it was in use by the Luftwaffe. North-west of the airfield his engine misfired and the aircraft struck the tops of a line of trees. He managed to restart the Mercury and struggle back to the lake. When he returned it was found that a branch of a tree had been forced between engine and propeller, and that one wing-tip had been sheared off, effectively putting an end to the Norwegian use of the Gloster Gladiator. 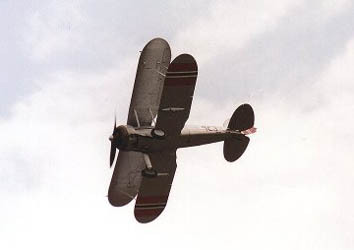 Gloster Gladiator in focus, 2004 Flypast June 2004.